Although my measurements are not official I am closer to the location than the Met office's nearest station. Are we having more rainfall than in the past? No see: Historic Rainfall Record Nearest Station Lyneham (1971-2000). The total average rainfall varies with no trend. The stats are for a period of ten years so any trend is unreliable but is improving. The total average rainfall compared to the Lyneham average is 60.9mm Lyneham to 50.8mm Freshford. These are very similar amounts but the graph for Freshford is more striking in its variation. 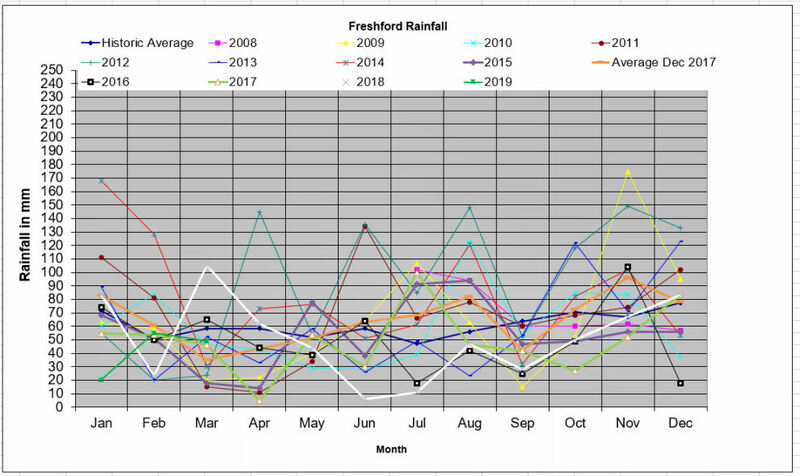 Both March and September tend to be drier with Freshford being slightly less dry, whilst November is wetter, a little less for 2018 .March rainfall for 2018 was actually a lot wetter than usual. Lyneham is not Freshford though and we may have a different amount of rainfall here anyway. However, we have not had more rainfall and snow than many other parts of the country. Freshford has a mild climate. Even the high rainfall figures shown below are monthly figures whereas we hear quite frequently of that amount of rainfall falling over one day in many parts of the UK. 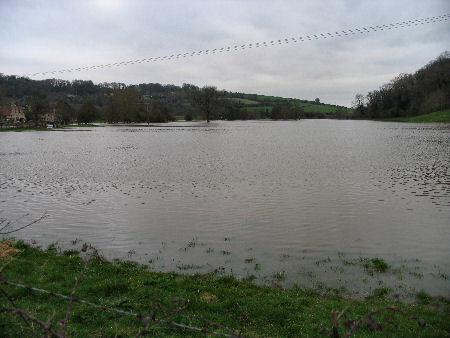 If we did have a very heavy fall of rain together with a high tide at Avonmouth and if the ground were to be waterlogged, Freshford Mill would be again flooded and to a much higher level than in 2008. The 2008 flood was after a long period of rain, not a heavy deluge. The site has been flooded again in November 2012 see Freshford Somerset for photographs and December 2013 (no photos were taken on site owing to difficulty of access). 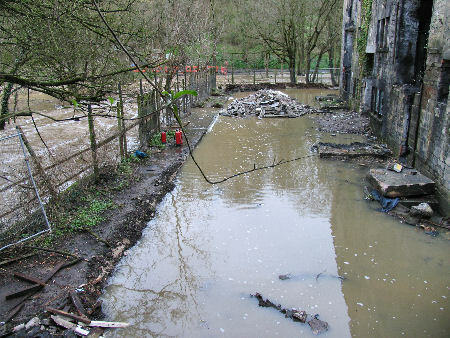 There has been little opportunity to see the effect of the recent flood defences in place at Freshford Mill. The chart below is updated at the end of each month. 24mm to date 13/04/2019. Historic average April 58.5mm Rain is measured each morning but might be added later in the day. 1mm recordings or less are often carried forward. It follows that the first day of the month loses its rainfall, if any, from midnight till when the reading is taken in the daytime as that rainfall if any, is added to the previous month's record. In practice if there is a lot of rain during the evening of the last day of the month I take a reading -but possibly not at midnight. During Saturday and Sunday the rainfall locally was in excess of 55mm, my rainwater gauge couldn't take the amount that fell. 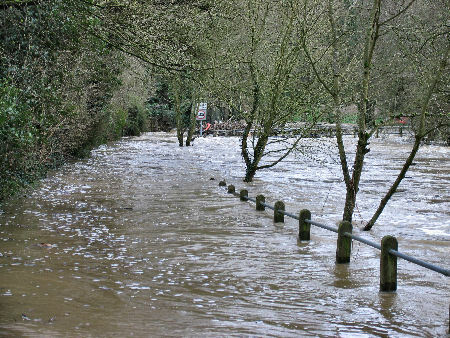 Subsequently I awoke to find that the river Frome valley was flooded and Freshford was isolated for the rest of the weekend. Whilst the regular floods tend to dissipate fairly quickly there is no denying the power of the river as the following photos show. However, with people dying of floods (June 25th 2007) deep concern needs to be expressed for the approval of a development that will need extraordinary measures to protect its inhabitants against flood. These measures include importing rubble to build up the land, even though this is undesirable, as it reduces the land's ability to absorb flood water. BBC News 27th June 2007 The consequences of such flood mitigation measures at Freshford Mill will reflect on the environmental impact of the development and are likely to be most unattractive..
UK Citizens fight Over Water! The website has been optimised for Internet Explorer at its most common display resolution of 1024 x 768. Furthermore there are photographs and video files that are best suited to a broadband connection. I make no apology for designing the website to these parameters as the intention is to assert the argument that we live in an extraordinary area of the country and this message is best portrayed by publishing high quality photographs. Most of the photographs are mine. I do not claim that I have by means of my photographs conveyed the magnificence of this countryside, in fact I believe that I have only tried to do so. Perhaps Joe Cornish, a renowned landscape photographer, might be encouraged to visit this area of England and spend some time photographing what we, as residents regard to be countryside of outstanding value, but are unable to fully capture on film. 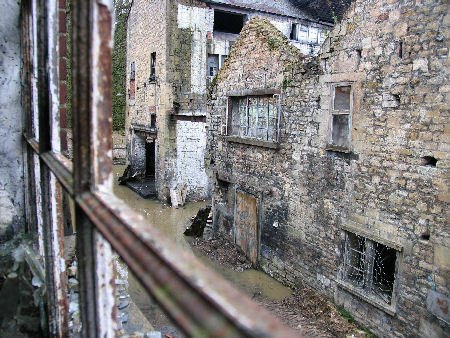 The Department for the Environment, Food and Rural Affairs DEFRA requested that the planning application for redeveloping the site known as Freshford Mill should be 'called-in' for their approval, before a decision is made. Unfortunately, DEFRA has now decided NOT to 'call-in' the planning application, and the BANES Development Control Committee has decided to 'permit'. The Government Office of the South West and "Planning Matters"
As this particular application has such important national ramifications for the erosion of the Green Belt which in this case is also within an Area Of Outstanding Natural Beauty and an Area of High Ecological Value we are entitled to know why DEFRA has changed its mind, especially when Freshford Parish Council had provided a long list of very closely reasoned objections to this planning application. (that can be read here) The correspondence on www.lettertothepm.com provides the "official reasons" unsatisfactory, although that may be. Since I was a child I have become aware by regular visits to the countryside with my parents that some parts of our countryside: the most beautiful, romantic, and interesting have been preserved for the nation by the National Trust. Land purchased by the National Trust (NT) is going to be safe for ever. Members of the NT provide the funds that are needed, and there are volunteers who help to maintain areas. When we see real countryside, we are often looking at a NT property or one owned by the Crown, a wealthy or aristocratic landlord or one owned by a large company. Some of our countryside and cityscapes are protected by the establishment of National Parks, Areas of Outstanding Natural Beauty and the Green Belt. In these areas local planning has more control over what residents, business and organisations can do. And there are Conservation Areas that further curtail and control indiscriminate development. Philosophy and Nature is a page of this web site where I have tried to convey my views of our responsibilities, I suppose we could take for granted, or agree, that preserving our physical heritage: structures, landscapes and seascapes is obviously important if not vitally important, but maybe the proposition needs to be set down on paper to reflect upon. Freshford Mill is located on the River Frome in Somerset ten minutes walk from the Inn at Freshford and close to the border with Wiltshire. 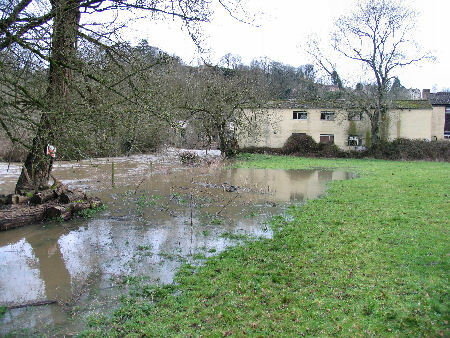 In fact, the existence of the Freshford Mill site, is itself, a threat to increased flooding elsewhere as the whole site has already been raised above the surrounding land. It would be good sense to remove not only the factory buildings but also the man-made plateau on which the buildings exist. There are also problems in Freshford when there is a cold spell due to snow and ice. The Freshford Mill Works (Peradins) is currently subject to a planning application for 21 dwellings . . . The residents of Freshford and their parish council, and we thought the area council had rejected the application by Southern & Counties (Suttons) Ltd. However, the application has now been approved by the Bath & North East Somerset Planning Service under a recommendation from Area "B" Development Committee. With no information given for its approval other than an underlying agreement that something does need to be done to remove the eyesore! The complete documentation for the application is available at Planning Services using the 'Public Access' service. To search you will need to enter the Application Ref 05/02563/FUL Note: if you include a space the search will fail, you should then be directed to a results page. This is what the situation looks like: entice developers to barter money for environmental cleanup in exchange for planning approval for dwellings? Is this the only way we can have the mistakes of former planning decisions cleaned up? The reality is that the developers, will most likely, recoup their money and more from wealthy people who will buy these dwellings -they won't be welcome here. They will be isolated from the village geographically and socially. Whereas, the Freshford Mill site could be a recreational area for the village and an education centre for the area, this is what the village wants. Our freedom of expression is under attack from the media, using terms such as 'Nimby'. The government has to be wary of accusations of being a 'Nanny State'. We are all subject to mind our words because of the pressure of political correctness. The present government is keen to encourage democracy at the closest most egalitarian level which is the parish council. Each parish council has to write a report which involves a survey to be carried out to find out what we do want and what we don't want for the future of our villages. This rather demanding activity is meant to facilitate appropriate development and improvements. There is inevitably going to be a measure of suspicion aimed at this government directive: especially, where in the case of the Freshford Mill application our local government officers have overruled their earlier decision to reject the application by Southern & Counties (Suttons) Ltd. and have not provided to date 10th March 2007, reasons for their decision. What's the point of carrying out a survey of our concerns when our concerns are ignored at the whim of the local government possibly under pressure from central government! All of this public consultation, whether on environmental issues or health, is a sham. Public views will of course be acknowledged if they coincide with those of the government! There is no doubt that the Freshford Mill site is an awful eyesore at present. It is as if the Development Committee have gone for a solution, that obviously they don't actually approve of, but approval would mean removal of the eyesore and the hazards that the site is alleged to contain. It is only in the removal of the eyesore that the whole village of Freshford approves, I have not met one person who agrees that the Freshford Mill site should be used for housing. The villagers and the wider community are entitled to a report on this about face. However, if Peradins were permitted to bury toxic waste by the local authority in the late 1940's then surely the local authority should foot the bill for cleaning the site up not a private investor. Or if at that time, the local authority were under direction from regional or central government then money should come from them. Here is the official rationale from John Prescott's: Office of the Deputy Prime Minister website. Historically, the only building that has taken place in the Frome valley, by the riverside, near Freshford has been the Freshford Mill. Local people are sensible and most vernacular buildings are located in places that are in harmony with the environment. The valley is not only subject to flooding but to mist, it is more likely to be misty in the valley than not. Low lying areas are not healthy areas to live in. These new dwellings will need more fuel to ensure that the people living there are living in comfort. The mist also affects safety on the roads, both for vehicles, and pedestrians. The war time authority made the mistake of building pillboxes in the flood plain. Here's a photograph of one taken recently! This flood didn't extend far into the fields but did threaten The Inn at Freshford where staff had sandbags ready. Unfortunately for this website, water that was in the fields had retreated by morning preventing recording the full extent of the flood. This photograph doesn't convey how strong the current was. However, photos taken down river at the bridge at Freshford show the full force of the river. 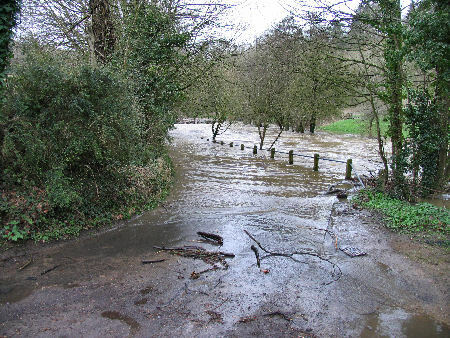 The Flood risk information page including maps and photos would convince any reasonable person that what amounts to building a new settlement should NOT be undertaken at Freshford Mill. 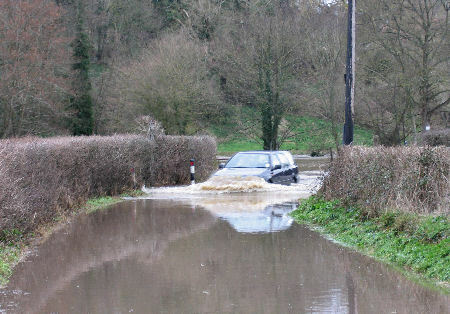 The Association of British Insurers have also stated that the risk of flooding is getting worse. In this country the only land that is left, is land that previous generations would not build on for what to them were obviously sensible reasons. What we have now is pressure to NOT build on unsuitable land. (deduced from the ODPM's website) but local authorities pressured by central government to build more and more housing! This housing is meant to accommodate not only indigenous citizens of the British Isles which is increasing quite slowly but the increasing number of people from the European Union (EU) which is expanding, the Old and New Commonwealth and a migration of UK citizens to Southern England, whilst more and more British citizens are emigrating mainly to Australia and New Zealand. All citizens of the EU that of course includes the UK and the Irish Republic are entitled to live and work and draw benefits in every other EU country. One major benefit of living in England is, apart from better work opportunities, the extremely important acquisition of the ability to speak and read the English language, a skill that has global value. The net inflow of emigration, whether for a limited period or not, is that the population of the UK and Eire is increasing whilst the attraction for indigenous citizens to go abroad - to Poland or Italy for example to live and work is almost non-existent. This factor and refugees, who favour this country rather than France, for example, is adding to the escalation in house values. Unfortunately, land like fossil fuel is a finite quantity and with global warming our gross land area will reduce in size. Already, it is realized that the coastal defences need to be partially disabled rather than improved to allow the seas to reclaim the land. If in future, the near future according to some forecasts, we need to grow more food within these islands we will need every acre or hectare of land that we have. In this case, the river Frome valley in Freshford is only suitable for sheep and cattle; and possibly for rice. Only lanes lead to Freshford Mill. single track roads with no passing places. BANES Development Committee decided to approve the application after consulting various reports. The Transport Assessment (TA) that Surrey & Counties (Suttons) Ltd commissioned from David Tucker Associates (DTA) is available to read on the BANES Planning Services Public Access web site. In that assessment DTA made a number of conclusions that need to be scrutinised. 1. This is perhaps, the only proposed settlement where for emergency access boats will be needed! 1.1 Reduce the need for travel? what by building a settlement where unless the residents use their cars they will have to walk along narrow, twisting dark lanes that are subject to flooding to a railway station over 1km away. Estimated time by foot over 40 minutes a day? excluding getting from the destination station to the workplace! 1.2 DTA's Traffic Assessment has an old survey of where existing residents work. One excellent way of reducing the need to travel, as there is no work in Freshford is to move to Bath or Bristol or Trowbridge or . . .
2. Freshford is not even sustainable, consider the list below, so how can Freshford Mill be sustainable? NB I forgot to mention that I cycle to the nearest bank in Bradford On Avon a return distance of 6 miles form the centre of the village Although there is a post office-shop at Westwood. 3.2 'or permitted use' the site can be used as a factory and if it were to be, even though there has been virtually no interest in the site since Peradins finally left in 1995, 'the amount of traffic would be considerably more than its proposed residential use'. This does not mean that there will NOT be an unacceptable increase in local traffic, which has been steadily getting worse, and worse, if two dozen dwellings are built. 4.1 we all know about what the highway authorities think of road safety: until someone is killed they don't recommend pedestrian crossings etc. 4.2 as to reducing stress, noise, safety for pedestrians, cyclists and equestrians . . .what about the government's plan to have "Quiet roads"? http://www.cpre.org.uk/news/view/11 surely this part of the countryside should qualify? I certainly would not walk along Staples Hill during the day, it's too dangerous, I am lucky I can use a bridleway and footpaths. No such luck for the would be residents of Freshford Mill. If this development goes ahead there will be more pressure for residents to use their cars for local use, as the safest place to be on the road is inside a vehicle. There is no evidence on the Internet for the last statement, but if you think about it, (do you need to?) it is self evident! Motorways are safer than other roads. http://driving.timesonline.co.uk/article/0,,15149-1565657,00.html Even the customers of the local pub, The Inn, use cars to get there! The Dwellings: Value for Money? I do not suppose that anyone contemplating buying a property in Freshford or other parts of the countryside has any illusions about whether their proposed purchase will be value for the money invested. But first it should be realised that property located in the countryside that has no garden tends to change hands more frequently and is harder to sell. The estate at Freshford Mill or whatever it will be called will have to levy a service charge for sewage treatment and maintenance of the community gardens and infrastructure including security. These charges increase the cost of living at Freshford Mill and will obviously affect the resale value of the dwellings. Will the properties be Freehold or Leasehold; a thousand year lease? Bath will probably be a seaside resort in a few hundred years time and the river Frome will be tidal. But before the dwellings are built someone has to be prepared to take on the uncertainty of borrowing several million pounds to invest in the development that will surely, always cost more than anticipated. There is talk that BANES planning is corrupt. After all they have not published their rationale for approving this application. So much for local democracy and open government. Of course this is merely talk, that arises from the resentment that residents have, to what appear to them, to be the unacceptable approval of planning applications when most of us have difficulty getting planning permission for a shed! Why haven't BANES planning department published the full text of the meeting that approved the application by Suttons. This documentation would have helped residents to raise objections that could be put before the councillors who eventually approved the application by five to three. And might even have changed the councillors minds about the proposal. Why isn't there a citizens right to inspect the written and other records that should be made whenever there is a meeting. Without these records, these meetings are effectively "secret meetings"
If the proposed development goes ahead, there will be 21 new dwellings for sale. These dwellings are new, they did not exist before, never in 1,000 years of history have dwellings been built on this site. The main reasons being: risk of flood and living in a damp environment. In the winter, for example, sunshine when it does shine, disappears after 12:00 noon in the valley bottom. 1. the local primary school has very few vacancies and has been extended recently, with little room for further expansion. A number of children are being educated privately, this has created some vacancies. It has also removed some of the brightest children from the school, at worst, or altered the balance of ability and behaviour at best. 2. the trip to school is dangerous, and time consuming on foot, you will need to use your car. 3. The dwellings don't have their own gardens, and the communal gardens will most likely be ruined by flood waters regularly. 4. the river Frome although beautiful is dangerous, very dangerous, your children will be living close to it. So who will buy these dwellings? wealthy people looking for a second home? This is an isolated settlement, it could easily be the target of thieves. or worse, vandalism (which is alive and kicking in the west country, there is an anti-cultural element!) police don't "exist". (response time London, 999, crime in operation: 90 seconds) this is not to blame the local police force, this is a large area!! So who will buy these dwellings? young single professional people who work in Bath or Bristol? This is an isolated settlement, it could easily be the target of thieves. You will either have to spend an increasing amount of money on fuel or use the train - inconvenient and time consuming and the service could be withdrawn and the fares will go up! Bristol takes at least 2 hours a day, there and back, to get to by car. What does that travelling time mean, well even if you pay yourself at an unskilled rate of say £10 an hour and only travel to work for 300 days a year it will cost you £6,000 of course if you value your time more highly then you should increase the amount and don't forget to add the cost of fuel. I would have thought that young professional people tend to prefer to live more centrally, in former docks areas of a city centre for example. 1. You will be dependent on your car and your telephone as this is an isolated settlement, it could easily be the target of thieves. 2.This is a damp, frosty area, being in a valley, it is not a healthy place to live. 3. the Frome valley gets darker earlier than the adjoining hillsides ,this is especially noticeable in the autumn and winter months. Don't you want to sit in the sunshine in the evening? and then there are the midges! 4. when there is a flood, which is certain, you will lose your car unless you decide to evacuate your home until the flood subsides. Or having planning approved the building of a platform, which is sure to be unsightly, to park cars on when there is a flood? Message to all potential residents: people have not lived on this site for the last 1,000 years. Correction, never! except for those individuals who have been virtually forced to live here. I have been driven with the desire to protect this exceptionally beautiful part of our countryside. 84% of the population of the UK live in England, that's 50 million people, and as mentioned elsewhere on this website apart from the Netherlands we are the most densely populated country in Europe. We therefore, need to take a strong stand against development in the countryside. There are so many objections to this proposed development that Freshford Parish council have so clearly presented, that are in no way a reflection of just the views of local opinion, but have far reaching implications for the UK and for other areas of the EEC, that the existing decision needs to be confirmed by central government scrutiny. This is the classic Slippery Slope situation where approval may lead to other applications to build on green belt land and within areas of outstanding natural beauty and areas of special scientific interest. Or at least, provide the grounds to cover footpaths and bridleways with tarmac and destroy ancient lanes and byways. The fact that it is necessary to have to create a website to support our objections is worrying, it is absolutely incredible that this planning application could be approved. We have had to fight the continual application of Suttons' to make a profit from their purchase of the Freshford Mill site. I have no sympathy for the company, but maybe planning do, as this settlement will remove the eyesore, with no public expense. I can find no other reason for approving this planning application other than that. There is another explanation that is that there is corruption. On reflection there may be another, that is that the approval of this real estate for property development will deter the building of a major road through the Frome and Avon valleys. Who knows what may be approved in future. The vicious scar that has been slashed in to the gentle hillside to accommodate alterations to the A46 trunk road at Bath further down the Avon valley is the sort of "development" that could happen virtually anywhere in this little island of ours. The new road is subject to a 50mph speed limit and needs speed cameras to control motorists who have a nice wide open straight road to speed down. The old road kept motorists from speeding anyway. I am quite happy, in fact I would welcome, the opportunity to include the argument for approving this application if requested, from both the planners and those that were minded to permit. View: Reasons for approval. I have provided in this website support for objections already raised by Freshford Parish Council. In Freshford we are blessed with Parish council officers who have the skill to formulate our objections to such planning applications. God help those authorities who do not have such capable people, as we seem to have lost the protection of the government. In the mistaken belief that local autonomy will be more able to make the right decisions. In this particular case, we have a majority of two councillors, two abstained. So these two individuals have approved a far reaching decision to build a new settlement on not just the green belt but in an area of outstanding natural beauty and an area of high ecological value (with protected species) and in my opinion an exceptionally beautiful location within these designated areas. I would be interested to hear from anyone who thinks that there are other areas that have this beauty within Bath and North East Somerset and West Wiltshire, Are there nicer areas? Apparently not, no response after over 2 years. (over 18,000 visitors to the web site Nov 2007) Did these councillors make the right decision, do they still think they did? Why are they silent? Some, possibly corrupt, at worst, or ignorant at best, officials approved the Peridins development in war torn Britain and now we have to live with that decision. Our national and international authority (EEC) have absented themselves from this decision. This means that the site could be legally used for industrial use. It doesn't say much for the law as an instrument to protect the environment does it? They agreed to industrial use. Change of use to residential is another matter. Suttons's haven't been able to sell the site to an industrial user. Easy, just set the price too high, this leaves an alternative, sell the site for residential development. And claim this is the only alternative. 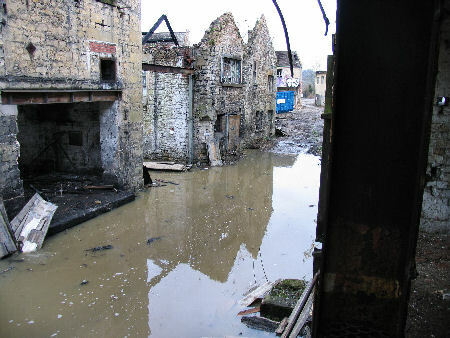 I was told by a representative of the company that a possible acceptable redevelopment of the factory site would be to build four houses, but was told that this would be financially impossible due to the costs of the extensive cleanup of the ground and removal of the buildings and all the other infrastructure requirements. Much has been said about sustainability yet here we have an ideal location for a working mill to generate electricity for the local community with a surplus that could be sold to the National Grid. Or will we have to face the imposition of windmills on our hillsides in future? My personal view, which is in sympathy with an already approved planning application presented by the village is that public money should be spent on clearing up the site as the damage was caused by publicly elected authorities in the past. That a proper working mill be incorporated in to the old mill buildings. And that the area should be used for recreation and conservation by locals and visitors. The case for a working mill on the River Frome (Somerset) to generate electricity may be reviewed here: Natural Power?